Creating an emergency supply kit all once once can be rather expensive and impossible for most families. But you can build one over time on a budget! Here are a few easy tips to help you create an affordable kit! 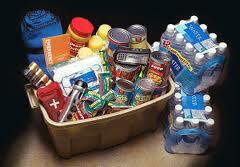 * Collect essential supplies first (water, food medication and a flashlight). * Rather than buying bottled water, save empty milk, soda or juice containers, clean and fill with tap water. * Look for 2 for 1 deals at the grocery store, place 1 in your cupboard and 1 in your kit ( non perishable food only). * Buys items when you see them on sale. * Look for items at Dollar Stores or second hand stores. * Put away $10 a week for your kit cash stash. * Buy crank radios and flashlights, so that you do not have to continuously buy batteries. * Ask for supply items as gifts on your holiday wish lists. * Utilize coupons for food, sanitary and first aid items. * Recycle your old gear~boots, gloves, flashlights, tools, uniforms and bedding in your emergency supply kit. * Don’t buy unnecessary items, build a kit to fit your families needs. * Every family is unique, so your kit will be as well. Create your kit with your family’s unique needs in mind.